Yep. You heard that right! 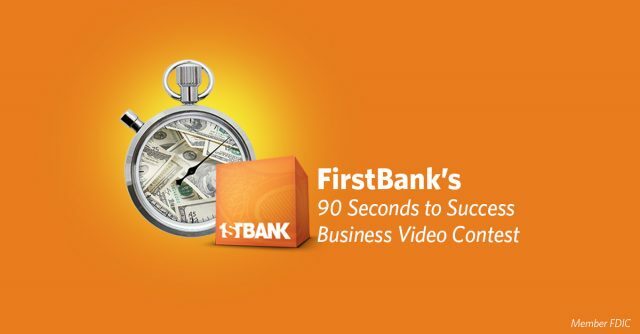 FirstBank’s popular business video competition is back. Renamed “90 Seconds to Success,” the contest will award two companies—one in Colorado and one in Arizona— $20,000 each (twenty thousand dollars each!). Runners-up in both states will receive $2,500. Business owners can enter from October 3-21 by submitting a 90-second video (MOV, WMV or MP4 format) explaining how the money will be used to accelerate their business. Videos will be judged 20 percent on originality, 30 percent on creativity and 50 percent on content. Five finalists in Colorado and Arizona will be selected by November 11. The winners will be determined by popular vote on FirstBank’s Facebook page from November 7-13 and announced on November 14.